My love for food ! 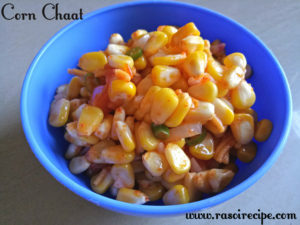 Corn Chaat is one of my favourite snack. This chaat is mix of all flavours, it is sweet, tangy and spicy. Perfect for breakfast or as a tea-time snack. You can even enjoy your movie time with this chaat, in case you are not in mood of having popcorn. You can also pack this dish in your kid’s lunch box also. 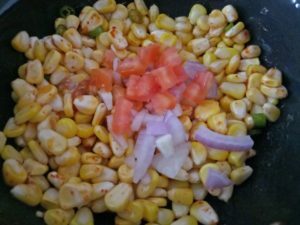 There are two ways of preparing this recipe, for healthier version you can boil corn kernels or corn cob (and later remove kernels), second way is stir frying kernels in butter or ghee. In this recipe, I have used second way. For this recipe you need, sweet corn kernels, butter/ghee, tomato, lemon juice, onion and green chillies. If you do not include onions in your diet, then skip onions. Seasoning of this recipe can be adjusted according to personal taste. You can share your re-creation of this recipe or any other recipe from Rasoi Recipe. You can share it on Facebook page or directly mail it to me on rasoirecipe@gmail.com . I would love to hear from you guys. If you have any suggestions or if you want to share your views or appreciation, you can leave your message in the comment section below. 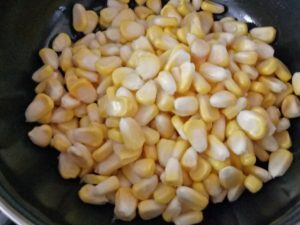 Wash and strain corn kernels. Keep them aside. Heat ghee/butter in a deep pan on low to medium flame. 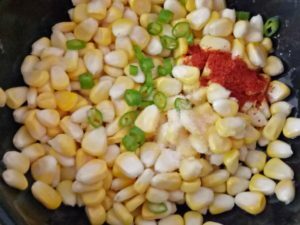 Add corn kernels and stir fry for few seconds. Add green chillies, salt, and red chilli powder. Mix well. 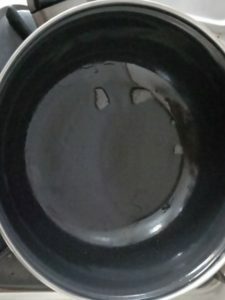 Fry for few seconds. Just before, when you are about to switch off the flame, add lemon juice, tomato, chaat masala and onion. Mix well. Garnish chaat with sev or any thin namkeen of your choice. Serve hot. If you are in hurry, prepare this chaat only with salt, red chilli powder and lemon juice. This recipe takes only 3-4 mins in microwave. You can prepare it in microwave also. 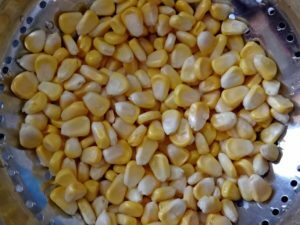 For healthier version of this recipe, boil kernels or corncob. This is so sweet of you. I love eating corn. This one looks really good.